European Commissioner for Digital Economy and Digital Society Maria Gabriel has visited the Institute of Information and Communication Technologies (IICT) at the Bulgarian Academy of Sciences (BAS) in Sofia on 13 October 2017 to discuss the EuroHPC-related perspectives and challenges in Bulgaria. Earlier that day, Bulgarian Minister of Education and Science, Krasimir Valchev, signed the declaration stating that Bulgaria is joining EuroHPC, in the presence of Commissioner Gabriel during her visit in Sofia. 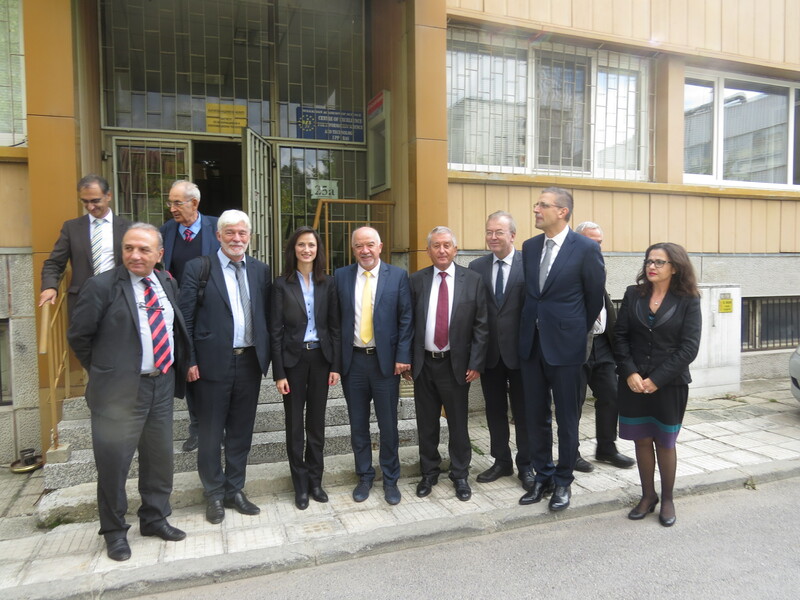 Commissioner Gabriel came to IICT, together with Dr. Thomas Skordas, Director of DG Connect; Dr. Thomas Lippert, Head of Jülich Supercomputing Centre; Dr. Ivan Dimov, Deputy-minister of Ministry of Education and Science; and other officials. They also visited the computing centre and were acquainted with the capabilities of the Bulgarian supercomputer AVITOHOL, which is the most powerful computing resource in the region of Southeast Europe. When AVITOHOL was put into operation in 2015, it took rank 332 in the TOP500 list of the world's fastest supercomputers. The supercomputer is used to solve major computational tasks in areas such as ecology, climatology, molecular dynamics, cultural and historical heritage, and more. Extensive calculations using its unique capabilities were performed for the forecasting of extreme snowfalls in Bulgaria during the past winter. IICT was founded on the first of July 2010 as a successor of three institutes, and serves as the National Centre for high performance and distributed computing, according to the Bulgarian Roadmap for Research Infrastructures. The institute integrates the strongest Bulgarian groups in several areas, including large-scale high-performance computations, parallel algorithms, Grid and Cloud, linguistic and semantic technologies, intelligent systems, and signal and image processing. One of the former institutes, IPP, was awarded two large EC grants as a Centre of Excellence in the project BIS-21 and Centre of Competence in the project BIS-21++. IICT participated in more than 50 international and national projects, including EGEE-1/2/3, SEE-GRID-1/2, SEE-GRID-SCI, EGI-InSPIRE, SEERA-EI, and HP-SEE. Currently, the institute is a core partner in the H2020 e-Infrastructure project VI-SEEM. IICT coordinated the 5-year national SuperCA++ project, establishing a Centre of Excellence for the development of supercomputer applications, which includes several universities and institutes. In the context of the project, the institute supported the development of HPC applications from different areas of science, e.g. environmental protection, semiconductor physics, biomedicine and bioinformatics, and targeting different architectures, including clusters, GPU and supercomputers. In the last few years, IICT established cooperation with SMEs working in different arias of the Bulgarian economics. Since 2013, IICT-BAS is involved in 13 projects with SMEs funded by the Operational Programme "Development of the Competiveness of the Bulgarian Economics".